The sales manager's step-by-step guide to better team performance. As an experienced sales manager, how do you improve your team's performance? 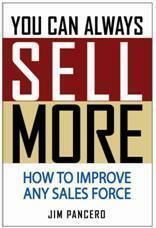 Which selling skills, developed to their fullest potential, have the greatest impact on revenues and profitability? You Can Always Sell More will guide you through a proven step-by-step system for evaluating, training, and coaching your sales force. It will help you establish a simple and effective evaluation and improvement planning process for even your most successful salespeople. Proven in a wide array of industries, this will also show you how to improve your ability to coach and lead a team of sales professionals.